Student Tyrique Mayfield was one of 93 students at Harris County Department of Education’s Academic and Behavior School West who received a backpack Sept. 27 at a school assembly, courtesy of Houston Independent School District. Mayfield shared a customary handshake and smiled as he was handed the grey-and-black pack full of school supplies. HISD Office of Special Education Services Program Specialist LaVora Wright attended the assembly and greeted the HISD students who are enrolled at AB West through contracted services. Harris County school districts contract with HCDE to provide specialized services along with a low, student-to-teacher ratio to education students with intellectual and developmental disabilities. The 15 HISD students enrolled at AB West received extra supplies in their backpacks, but all students were given backpacks due to the tremendous outpouring of contributions donated through Hurricane Relief Day hosted by HISD. AB West parent Janet McCall from Fort Bend is a foster mom to three children. She also is responsible for her disabled husband. The McCall family lost their home and all their possessions during Hurricane Harvey. She received donations of clothing for AB West student La’Quesha through the assembly. Through the assembly, four AB West teachers displaced by Harvey were also given donations from AB West staff and community. “We are a family here at AB West, and helping those who are displaced and lost so much was the right thing to do,” AB West principal Victor Keys said. To view photos from the event, go to http://hcdetexas.photoshelter.com/gallery/ABW-Backpacks/G0000jQj69QCLflk/C0000Ocq75eZ9lcU and enter password hcde1889 . 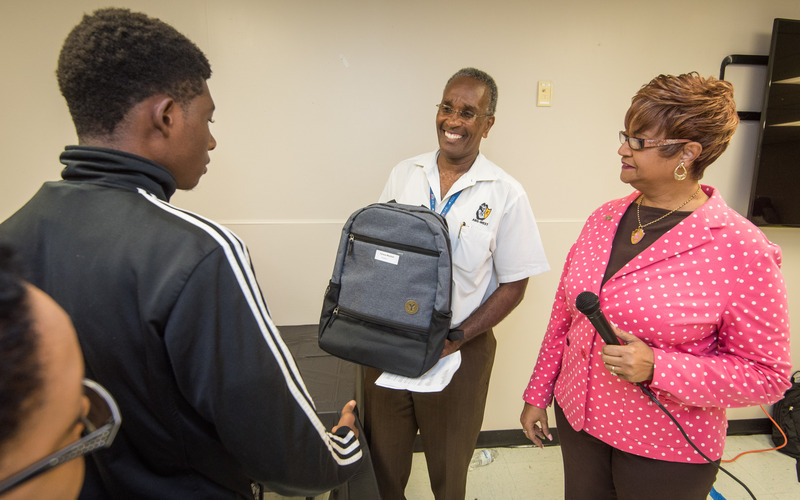 Photo: Student Tyrique Mayfield accepts a backpack from HCDE principal Victor Keys and HISD program specialist LaVora Wright. Students were very grateful when Dr. keys distributed the backpacks to them, especially the life skill students. Good job Dr. keys!. May God bless you and HCDE. You have demonstrated our mission statement ” Value through services”.